I have to admit, my first thought when I finished this book was, "hmmm, that was interesting." In fact, I wasn't really sure what I was going to rate it, much less how I was going to review it. The one thing that I knew was that it was different from any other book I have ever read. In the two weeks since I finished the book, it hasn't gotten any easier to define my feelings, except to say that this was a book of contrasts for me. 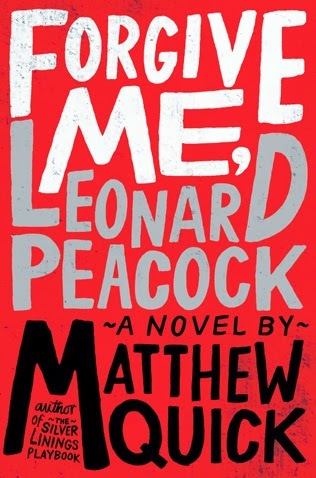 It was filled with moments of clarity and confusion, profound quotes and wasted words, important insights and trite excuses and a jumbled mass of Leonard's present and past. Perhaps it is easiest to start with an overview of the story. It is Leonard Peacock's birthday, and for his birthday he has decided to kill his former best friend, Asher Beal, and then himself. Before he can do that, though, he has a present to give to the 4 people that he considers the most important in his life. Sounds straightforward, doesn't it? But nothing about this book is straightforward. Not the writing style that Quick uses, not the motivations of the characters, and certainly not the mind of Leonard Peacock. To say that Leonard is damaged goods is an understatement. From the beginning it is apparent that he is one of those kids in high school that just don't fit in anywhere, but the why is a lot less clear. As Leonard tells his story, we are given a lot of the events in his life that led to this point. What we don't get much of is the thoughts, feelings, and motivations of the characters that lead to these events. One of the most interesting things about this book was the writing style that Matthew Quick used to tell the story. The basic events of the story are told by Leonard in narrative form. As such, this part of the book does not give much insight into what the characters are thinking or feeling. We are treated to the inner workings of Leonard's mind, though, in the form of footnotes to the narrative. These are mostly the rambling of Leonard's inner mind and, as such, they have a more conversational and intimate tone. It is here that we get more of a feel for Leonard's emotional well being and state of mind. Then there are the letters. They appeared out of nowhere, leaving me confused as to their purpose at first. In the end, I was left wondering whether all these contrasting story devices and the confusion that are their result are a the mark of an author who has lost control of his story, or the result of a genius who is using them to illustrate the contrasts and confusion of the character that is Leonard Peacock. It would be easy to dismiss them as the former, but that would be doing the book a disservice, I think. In the end, I found that using the various devices worked for a couple of reasons. First, I thought they worked to show the different facets of Leonard's character. Secondly, they allowed me to feel some of the confusion that Leonard's life had become and the conflicting emotions he had about himself. What I found most disturbing about the book, was the lack of awareness of any of the adults in Leonard's life. In fact, of all of the adults that we encounter in the story, only one seems to have any idea that things in Leonard's life are about to spin out of control. The rest of the adults, from Leonard's absentee mother on down through the school administrators and teachers, seem determined to let Leonard down. The ones that are not incredibly self-absorbed, seem bent on pretending that everything is normal and either there is nothing to worry about, or if there is, there is nothing they can do about it. Admittedly, the story is being told from the viewpoint of a student, who is likely to see the adults as shallow and self-absorbed. Even so, I felt that there was an important lesson for adults here. Bottom line, this is not a book for everyone, that is for sure. As a reader, though, I found that it elicited strong feelings and for that reason I am giving it 4 stars. Some readers may find the jumble of story telling devices confusing, or Leonard's attitude either too whiny, to wrapped up in excuses, or just not realistic. I found that those items were the ones that made me think and ultimately to question what I was reading. Given the subject of this book, I think that is an important outcome. My one caveat is that I was left feeling that this book could be either a positive influence on a teenager, or a negative one, depending on the reader. I actually told one friend I was not sure how I would feel about my sons read it if they were a teenagers, but I could certainly see it starting some good discussions. My advice as a parent is to look at the book yourself, and then determine if it is right for your teenager.